The independent's campaign fires back at ads sponsored by national pro-Republican groups. 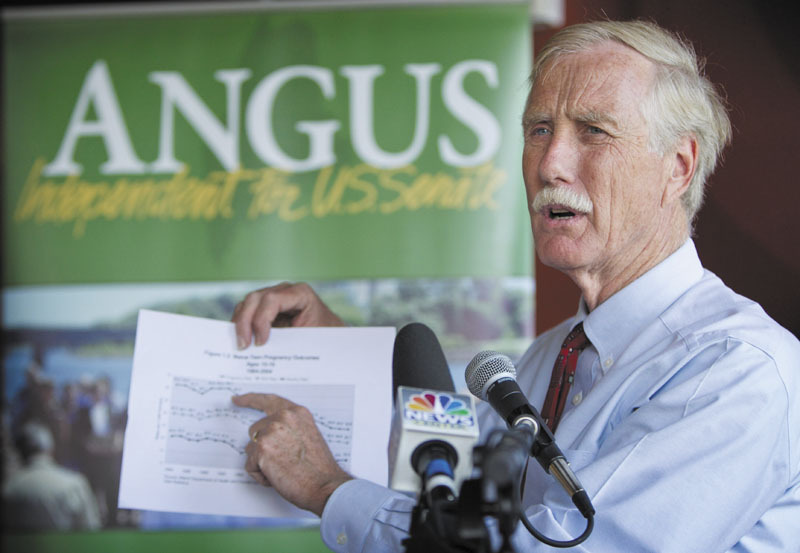 Two more waves of anti-Angus King TV ads will air this week as national pro-Republican groups continue to pump money into Maine’s U.S. Senate race. The campaign posted videos on YouTube countering some of the criticism. Maine Freedom, a group led by Republican strategists, is also putting more money into advertising aimed at cutting into King’s lead in the polls, according to new Federal Election Commission spending reports. The group’s ad, which has been running for weeks, touts the Democratic candidate, Cynthia Dill, in an effort to take Democratic voters away from King. Both groups hope to help elect Republican Charlie Summers, although Summers is not mentioned in the ads. A spokesman for Summers said Tuesday that the ads are simply holding King accountable. “Angus King has made his record as governor and in business the centerpiece of his campaign. Mainers deserve to know about that record in its totality, not just the parts King picks and chooses to tell them about,” said Drew Branderwie in a written statement. The Summers campaign also said this week that King’s reaction to the ads is hypocritical. King used negative ads when he ran for governor in 1994 and has raised more campaign donations from out-of-state sources than Summers, it said. King also was supported by a Super PAC, icPurple Inc., which spent $24,000 on an online advertisement supporting him, the Summers campaign noted. He said the new ad is deceptive because it uses a partial quote of his — “When I’m campaigning, nobody talks to me about health care or even the economy” — to suggest that he doesn’t care about the economy and middle-class Mainers. King also disputed the claim in the chamber’s first ad that he left the state with a $1 billion budget deficit. The word deficit was changed to shortfall in the new ad, though the claim is otherwise the same. After King left office in 2003, the Legislature had to close a projected gap of nearly $1 billion between spending and revenue. Unlike the federal government, which borrows money to balance the budget, Maine’s Constitution requires that the state budget be balanced. On Tuesday, King cited state records showing that 10 of Maine’s last 11 two-year budgets started with the governor and Legislature having to close a structural gap between projected revenue and spending. “The only structural surplus in the whole 22-year period was when I was governor,” King said. That surplus was the product of an economy that grew faster than budget writers expected. King’s campaign posted a video on YouTube countering the deficit claim. “The people who are sponsoring these ads don’t care one single bit about Maine. Zero. They don’t know the difference between Portland and Presque Isle. It’s all about power in Washington, and they are afraid of someone coming down there that they don’t own,” King said. Outside groups have now spent about $1.5 million on anti-King TV commercials statewide. Maine Freedom has spent $359,000, according to FEC records. The U.S. Chamber of Commerce is believed to have spent more than $600,000, although complete FEC reports have not yet been posted. Meanwhile, the National Republican Senatorial Committee is reportedly planning to spend $600,000 to air an ad criticizing both King and Dill. Republican chances appear to be weakening in other states, making Maine’s open seat more critical if the party is to win a majority in the U.S. Senate. A new poll this week, for example, suggests that Democratic challenger Elizabeth Warren has increased her lead in Massachusetts over Republican Sen. Scott Brown. The Republican strategist Karl Rove was quoted recently as telling Republican insiders that the party needs a win in Massachusetts or Maine.